Summary: While the office celebrates Halloween, Michael tries to avoid the fact that he has to fire someone by the end of the day (and has no idea who!). Jim and Pam secretly post Dwight’s resume online. 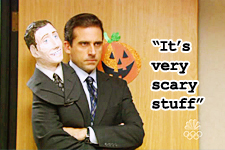 Very Scary Stuff: It’s Halloween at Dunder Mifflin, and everyone is all dressed up. It’s also the end of the month, and Michael is suppose to let an employee go. One problem: He has no idea who. He agonizes about this decision for most of the day, and even tries to get Pam, Dwight, Jim, and the accounting department to recommend someone to fire. “I’m going wherever they value loyalty the most”: After Dwight insults his costume, Jim decides to post a resume for Dwight online, hoping Dwight will get an offer and leave Dunder Mifflin. With Pam’s help, he write a resume, and pretends to be Michael when a potential employer calls for a reference. Later, Cumberland Mills calls Dwight about a job, though Dwight is concerned that the resume they have is not his official resume (complete with martial arts skills). “You should go for that job”: Pam encouraged Jim to go for the Cumberland Mills job. Jim, clearly hurt that his crush would suggest leaving Dunder Mifflin, halfheartedly agrees and sulks off. Jim avoids Pam for the rest of the day, until Pam pulls Jim aside and tells him her job would drive her crazy if he ever actually left. “I just hope that you and I can remain friends.” It’s getting to be the end of the day, and Michael is forced to bit the bullet and fired someone. He calls Creed into his office, but Creed basically refuses to be fired, and suggests that Devon is the one who should be fired. Michael succumbs and calls Devon into his office. Devon is furious as he leaves the office, asking most of the office to come have a drink, and telling Dwight, Angela, Michael, and Creed to “go to Hell”. The “Can’t please everyone” Medal: If there’s anything Michael hates, it’s having to be responsible for the tough, unpopular decisions, and that fact is in full display in this episode. The “Homemade Costume” Medal: If anything, this episode provides a lot of low-cost costume ideas. 3 round pieces of paper taped to a shirt: BAM, 3-hole-punch you! Sherri: [on phone] Jan Levinson’s office. Michael: Hey, Sherri. Michael Scott returning. Sherri: Oh, she’s in a meeting. Uh, she just wanted the name of the employee you let go. Michael: Well, I’m gonna wait till the end of the day. Because the book said it’s best to wait till the end of the day. Sherri: I just need the name of who you’re planning to let go. Michael: I don’t know… yet. I will have to call her back. Sherri: I know she wanted the name. Michael: If you were getting fired, how would you wanna be told so you could still be friends with the person firing you? Sherri: Jan wants the name as soon as possible, Michael. Michael: I’ll call her back. [talks softy, to himself] Wish I could fire Sherri. Sherri: Hey, I’m still here. Michael: Um, Pam, I have to let somebody go today. This is, uh, the hardest thing I’ve ever had to do. Pam: Why did you put it off until Halloween? Michael: Because it’s very scary stuff. Pam: I think it’s gonna put a damper on the party a little. Michael: You’re worried about the party? There’s a man’s life at stake here. Pam: So it’s a man? Michael: No. Or a woman. A human life. Jim: I’m a three hole punch version of Jim. ‘Cause you can have me either way. Plain White Jim, or Three-hole Punch. Michael: Mmm-hm-hmm. Interesting take on Dorothy. I love it. Hey, you know what would even be better? Soccer ball and cleats. Kelly: Oh, like … the movie about the Indian girl who plays soccer? Michael: [laughs] Yeah. That would be perfect. Kelly: Yeah, I mean, I guess I could do that. I don’t really play soccer or anything. Jim: We’re really interested most in jobs that take Dwight out of state. Um, preferably Alaska… or India. Angela: … that has three people … doing the work that could be done by two. Oscar: This is great. [Angela shakes her head] Oh. Pam: I’m guessing Angela’s the one in the neighborhood who gives the trick-or-treaters some toothbrushes. Pennies. Walnuts. Jim: Michael Scott here. Yes, I am regional manager of this orifice. Dwight Schrute is amazing. Yeah. No, he is actually the single greatest employee of his generation. You know what? I’m gonna tell you what. You hire Dwight K. Schrute, and if he does not meet, nay, exceed every one of your wildest expectations, well then, you can hold me, Michael Gary Scott, personally and financially responsible. Okay. Okay. Okay-kay-kay-kay-kay. Okay. Dwight: I’m just not sure that it’s my official resume or if it’s something that maybe a satisfied customer posted online. What does it say under martial arts training? Oh. Okay, I’m gonna have to supplement that. Dwight: What do you mean? Of course martial arts training is relevant. Oh, excuse me! I know about a billion Asians that would beg to differ. Creed: Let’s call Jan and fight this thing together like the old days. Michael: What old days? What are you talking about? One of the producers posted a resume for Dwight Schrute on Monster.com a month before the episode aired. According to commentaries and various interviews, this episode was intended to air after The Client and Performance Review. Though they’ve been in the background, this is the first time we hear Creed and Devon speak. possible continuity error: in “The Alliance” it’s mentioned Meredith is an accountant, but in this episode it’s stated there’s only three accountants: Angela, Kevin and Oscar. foreshadowing to future episodes: Michael’s comments about Oscar “showing his true colors” by dressing as a woman could be considered the first reference to Oscar being gay. foreshadowing to future episodes: Michael’s paper mache head is seen again in Diwali (since Michael thought the Indian holiday was like Halloween). foreshadowing to future episodes: In Fun Run, Angela shows the camera a picture of her and her cat, Sprinkles, on Halloween with Angela wearing the white cat costume she wore in this episode.